A wonderful plant, Erysimum Bowles’s Mauve flowers almost all year round! Which is great as it provides early and late season nectar for those insects on the fringes of the seasons. The little mason bees that colonise the bee hotel love it in March and April, and the last of the bumblebees and butterflies use it to stock up on nectar before winter arrives. It’s a beautiful plant and the flowers smell divine - I wouldn’t be without it. It can get a bit woody and tired after a couple of years, but propagates really well from cuttings. Buddleia has a bit of reputation for being a thug in the wild. Buddleia davidii is the type that you see running rampant alongside railways and bits of wasteland, and it can often crowd out other plants. But there are some lovely cultivated and less thuggish varieties that are great for the garden. I have lots of Buddleia x weyeriana ‘Sungold’ in the garden - it doesn’t set seed, flowers for months, smells like honey, and is covered in bumblebees, butterflies and hoverflies throughout late summer. We have three cotoneaster shrubs in the garden and they are humming with bees and wasps in Spring when they are smothered in tiny nectar rich flowers. Then, with a second flourish of goodness in Autumn and Winter, they are smothered in red berries which are irresistible to many birds, particularly the blackbirds and thrushes in our garden. A native wildflower, I collected some Common Knapweed seed from a patch growing wild at the side of a nearby reservoir. One seedhead gave me dozens of plants which grew very easily and quickly from seed, and it is both pollen and nectar rich making it hugely attractive to all kinds of pollinators, including bees, butterflies, hoverflies and beetles. It’s cousin, the Greater Knapweed, is equally as useful and easy to grow. Emma's Garden on BBC Gardeners' World! Well. Appearing on one of my favourite television programmes was never on my to-do list for 2015, but today that happened! A few months ago I was contacted by one of the Gardeners’ World (GW) researchers, who had been given details of my website, unbeknownst to me, by a friend. The GW team really liked the fact that we rent a house with a very normal, average garden and that I’m able to attract enough wildlife to it to run a growing business (no pun intended!). After emailing back and forth for a few days, the researcher came round for a cup of tea and a chat in the first instance - after all, he'd only seen my pictures on my website and had no idea of what the wider garden looked like. For two days before he arrived I was frantically deadheading and titivating to make the garden look as presentable as possible - it's a little on the wild side, which is how I like it, but at the same time, I wanted it to look its best! The researcher walked round the garden with me and filmed me talking about the plants and why I'd planted them, and what wildlife they attract, and also a little bit about my photography and why I do what I do. I guess you could say this was the interview stage! Luckily, I passed, and in early July a film crew of four arrived at 7am to make the most of what turned out to be a gloriously sunny day. It was amazing to see the amount of work that goes into creating what would turn into a 5-6 minute piece; the director especially was incredibly creative and had a very clear vision of what she’d like the piece to be, the ‘story’ of it, if you will. I’ve never done anything like this before, and am pretty much always the one behind the camera, let alone the one in front of one that is filming as well as taking photographs! But the team were so very encouraging and even with a microphone taped under my clothes for the whole day, it was such a fun and relaxed experience. I was sure to have the microphone removed when I needed a loo break though - apparently there have been some mishaps in the past..! The wildlife didn’t disappoint either - we had plenty of bees, butterflies, hoverflies and birds making themselves known - I’m especially pleased that the little thrush that visits us most days wasn’t fazed at all by the presence of all these new people, and she stopped by quite a few times to get a few beakfuls of mealworms from the bird table. As we waved goodbye to the crew at around 4pm, I felt exhilarated and exhausted in equal measure. I have a huge amount of respect for those people who do this particular work day in and day out - I don’t think you can really pick up on how much work goes into it from just watching a short film on a television programme. As well as all of the filming and subsequent editing, these guys travel all over the country to do this too - they drove all the way from Bristol to film our little garden, which is a good 5-6 hour round trip. But I’m so very glad they did. I had so much fun, and I really hope you enjoyed watching the resulting film. And if you'd like to hear more about my little 'Shortmeadow' and the wildlife it attracts, along with advice and tips on how you can do the same in your garden, you can find me on Facebook and follow me on Twitter. I was thrilled to spot this gorgeously exotic visitor in the garden during my final Big Butterfly Count at the weekend - this is the only picture I managed before it flew away! This is a Painted Lady butterfly, a migrant visitor to our island, flying here from North Africa, the Middle East, and central Asia. Sadly, it cannot survive our winters, and the numbers that arrive here fluctuate widely year to year. Some years, however, they arrive in great numbers, and can cause quite a lot of excitement in the butterfly world! This year is said to be a bumper year - let's hope my visitor returns to the garden so I can snap some more pictures! You can see more video highlights of the nest on the Emma's Garden Live page. I’ve been putting off writing this blog post for a few days as it’s a bit of a sad one I’m afraid. If you’ve been following the progress of the swallow nest on Emma’s Garden Live or my Facebook page, you’ll know that four of the five eggs hatched in early/mid July. The adults were fantastic - feeding their chicks every few minutes during the day, and mum brooding them at night. They were growing fast and we decided to contact a BTO endorsed bird-ringer to come and ring the chicks. This was fascinating to see - Geoff from the Sorby Breck Ringers group came over one rainy morning last week and ringed the chicks in about ten minutes, with the adult swallows perched a small distance away, just keeping an eye on their young. He even let me ring the last chick! Geoff came in for a cup of tea after and we kept an eye on the livestream, to ensure that the chicks and parents were happy. Before long, the parents were back to swooping in with beakfuls of insects for the chicks, as if nothing had happened. I was delighted that the nest was doing so well, especially after the events of last summer. Unfortunately, the following evening we heard a lot of commotion outside, with swallows alarm calling loudly. We dashed outside and looked at the nest and we could see that there were only two chicks present, and some of the mud nest cup had been loosened and pulled away. Andrew rewound the livestream, and we could see a cat had managed to get to the nest and take two of the chicks. We think it was one of the feral farm cats that live not far from us. We were so upset. The parents quickly abandoned the nest, and didn’t return to it that evening, or the following morning. The nest location itself is a bit of a poor choice - it’s under the eaves of our shed, at head height - within easy reach of predators. And as the chicks got older, they became more vocal, especially when the parents were flying in with food - this could easily have alerted the cat to their presence. There is a ray of hope however. The following morning, I watched the nest for an hour or so, to see if the parents did in fact return. They didn’t. One of the two remaining chicks had perished in the night, but there was still one alive. I gently picked it up and was surprised at its strength! It had a great grip on my finger, seemed very alert, was warm, and was even trying to flap its developing wings. I decided then and there that we had to try and give this chick the best possible chance of survival! I popped it in a cardboard box, with an old t-shirt for warmth and drove it up the motorway to a wildlife sanctuary, just north of Chesterfield. The lovely ladies from Pet Samaritans took the swallow in and called it ‘Lucky’. A very apt name, I’m sure you’ll agree. As I was leaving, it was being taken away for some food and a heat pad. Fingers crossed that little Lucky survives. I shall be sure to keep you updated as and when I hear anything. Tree bumblebees, Bombus hypnorum are known for their love of using old bird nests and bird boxes for their own nests. We had a tree bumblebee nest in the garden of our last house - it was great fun watching them coming and going with such purpose. Our swallow was interrupted during her brooding at the weekend by a tree bumblebee! Clearly the eaves of our shed are prime real estate - for swallows AND bumblebees! We were delighted and super excited to discover a pair of swallows nesting under the eaves of our shed early last summer. Four eggs hatched, but sadly none of the chicks survived to adulthood, as they were pulled from the nest by a rival pair of adults. However, good news! A pair of swallows has returned to the nest, and have 5 eggs that the female is now brooding. You can see a live stream of the nest here, with regular highlights and updates on the development of the nest. The eggs themselves are beautiful - I think they look a bit like tiny guillemot eggs! The egg cup is lined with soft downy white feathers that the adults 'foraged' for when they were refurbishing the nest a few weeks ago. These feathers help to keep the eggs warm when the female is away from the nest feeding. They should hatch in about two weeks time - egg-citing!! We are so lucky to share our garden with so many birds. Out of all the houses we've lived in (and our friends and family will be the first to agree that we've been quite nomadic so far!) this has been the most diverse in terms of the wildlife living here and in the surrounding area. We live in the countryside and there is a reservoir a short walk away, which I think helps in terms of the local biodiversity. If you want to attract more wildlife into your garden, make a pond - so say the experts - and I'm inclined to agree. All wildlife needs water, and even a small sink pond, like the one I made in Spring last year, is enough to increase the life in your patch. Not bad! And because quite a few of them are regular visitors, I've learned to recognise some of them by their calls and songs, so I often hear them before I see them: 'birdwatching with your eyes closed' - which also happens to be the title of a great book by Simon Barnes. 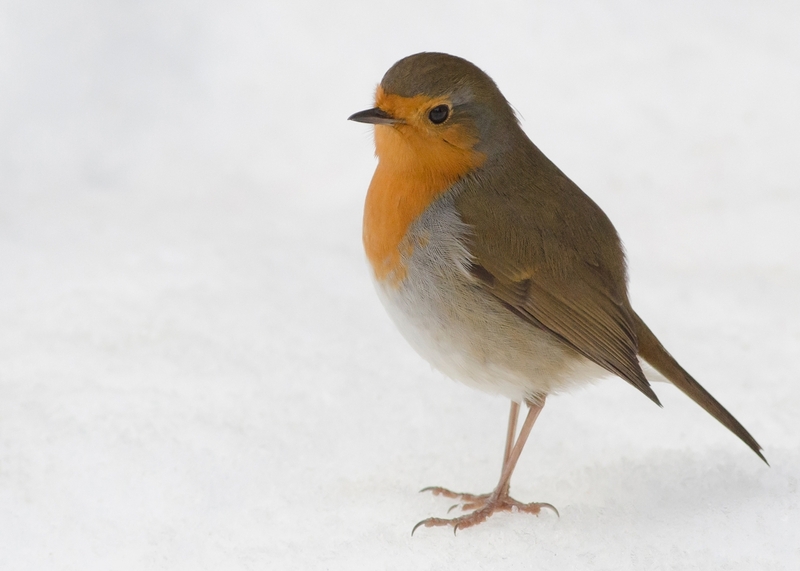 Will you be taking part in the RSPB's Big Garden Bird Watch this coming weekend? I certainly will be - hoping to tick off most of the birds above! I look forward to hearing if you take part and which birds you spot! We had such a great time at the Victorian Christmas Fayre in Melton Mowbray at the weekend! Dressing up is always good fun, and Andrew loved getting into character and brandishing his duck headed cane around with gusto. Huge thanks go to my lovely sister for my fabulous apron - it received so many complements, it really is something special! Very tempted to make Andrew wear it, along with the bonnet, while he cooks Christmas dinner... I'll be sure to post some pictures if I succeed! Over the last couple of markets, we've had a few people comment on the pricing of my pictures, and not always in a positive way! I wanted to jot down a few reasons as to why I charge what I do, and that in fact, the prices are extremely reasonable when the process of creating them is broken down. We don't pluck the prices out of thin air! If anything, the prices are in a state of flux. The business is very young, and we are still getting to grips with what works and what doesn't in terms of marketing and pricing. As an example, below are a few things that we factor into the price of the website sold mounted limited edition prints. This is probably the most enjoyable part of the whole creative process for me, but also the most time consuming. I spend a lot of time watching and waiting, and planning and anticipating my images. I'll maybe shoot half a dozen or more, and won't be happy with any of them the first time round. I'll reposition, try a different angle, adjust my camera settings, take another half dozen, and maybe be happy with one or two. I'm a bit of a perfectionist. Sometimes an image is down to luck and being in the right place at the right time and it's great when that happens. But more often than not, I can spend an hour, two hours, sometimes even three or more on one shot. Post processing. I do try and keep this part to an absolute minimum if I can, bar a few tweaks, dust speck removal, and a crop if I'm not happy with the framing of the subject. I use Adobe Photoshop for any tweaks that I do have to make. We have a large amount of network attached storage at home due to the sheer quantity of images I take, and I also pay a monthly fee for additional online backup of all my images. Ordering the prints. As a small independent business, I try to support other small independent business whenever I possibly can. My supplier of the prints is a local family business about 20 minutes away. I upload my files to their system, choose the paper I'd like, specify the size of the print required, and then they work their magic. If I wanted to, I could just have glossy photographs printed for a few pence by a big national company. But Steve at the printers does such a fantastic job, and the finished prints look like paintings. The paper I choose for the prints is Hahnemuhle German Etching, which has a gorgeous texture and, along with the printing process, produces some of the richest colours I've ever seen. Mounting. At the moment, I mount the prints myself. I order ready made conservation grade mounts and backing boards and spend a few hours painstakingly mounting a dozen or so prints. As it's not something I've ever been trained in, I've taught myself, which means that I can keep costs down to a minimum. Again, I could pay someone else to do this for me, but that would add even more to the cost which would then need to be passed on to the customer. And it's actually very enjoyable! There's something very satisfying about going outside of your comfort zone and then seeing the results of your efforts. Before they can be listed on the website, they need photographing themselves! And to make them look appealing to potential customers means using props, backdrops, and different techniques to those employed when I'm outside photographing insects. Listing the prints on the website. I designed and created the website myself, using Squarespace. I pay a monthly fee for the service, which means I have the freedom to make changes to it whenever I want to. Everything that is on the website has been added by me, and I take a lot of time and pride in making it look good. I do enjoy this bit! Pinterest, Instagram, Twitter and Facebook are all free to use, but a lot of time goes into creating posts and tweets. Some work, some don't, it's a learning process. But the pleasure I get from interacting with people and chatting about wildlife and gardening makes it worthwhile. I made the decision to have recorded postage included in the price of the prints as I didn't want an additional (high) postage charge to be a barrier to people purchasing. All of the above for the current sale price of £29.99. I don't think that's too bad, do you?! It’s bee season. Honey bees, solitary bees, bumblebees; they’re all starting to become more active as the days warm up and pollen and nectar are produced in abundance. I made a bee ‘hotel’ for the first time this year, and I’m delighted with how popular it’s proven to be thus far with the red mason bees, Osmia bicornis. I’m writing this whilst sat underneath it, and they are making regular trips to and from the bamboo tubes in the hotel. I have about eleven tubes sealed so far, with more due to be sealed in the next few days I imagine. It’s fascinating to watch the process of nest making. The female red mason bees choose a tube that they’d like to set up as a nest site, and it’s here that they’ll lay their eggs, in individual cells. They make numerous trips into the garden to forage for pollen and nectar (dandelions are popular at the moment) which they deposit in the tube. Once they have enough pollen they lay an egg and then start to make trips into the garden for mud, to seal up the cell. This creates a cosy self-contained little space for the egg to first develop into a larva which will eat the protein packed pollen, and then the larva will pupate into an adult bee and hibernate over winter. Come spring, the adult bee will burrow through the mud that is sealing the cell and emerge to mate and start the process all over again. I’m hoping that we’ll soon start to see leafcutter bee activity. The process is the same, but instead of using mud to seal their cells and tubes, they use neatly cut pieces of leaf, which gives them their name. I’ve popped a rose bush underneath the hotel as they like the leaves from roses. It’s a bit too early for them to be on the wing though yet. It’s quite easy to set up a bee hotel of your own. I’ve got off the shelf ones and my ramshackle homemade one, and it’s the homemade one that is in use at the moment; they don’t seem to be interested in the others! Should have saved my pennies… I used the instructions in Kate Bradbury’s wonderful book, The Wildlife Gardener. I highly recommend this book to anyone who’s interested in gardening for wildlife - it’s full of beautiful pictures and Kate has a lovely writing style - it’s a joy to read and is incredibly informative. I’ll keep you updated on the bees’ progress. I could spend hours watching them…!